A total of 1,141 kanals of land out of 6,810 kanals allotted to Tibetans by the District administration were found sold illegally by Tibetans to the locals. 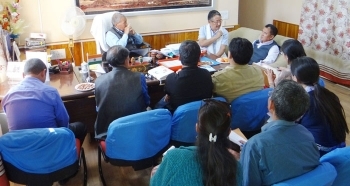 In this regard, a meeting was held between the Hill Council, Leh, and the Central Tibetan Administration, in which issues pertaining to Tibetan residents in Leh district were discussed on August 25. Sonam Tobgais, Home Minister, Central Tibetan Administration, requested the Hill Council to take up the issue with the enforcement directorate, J&K, and to issue a notice or take action against the Tibetans who have illegally sold their government lease land to locals in Leh. The Hill Council, Leh, and Central Tibetan Administration have decided to take action against people involved in the illegal selling of government land. According to CRO office, Leh, a total of 7,500 Tibetans are residing in Leh district. There are 12 Tibetan rehabilitation camps in Leh (Choglamsar, Agling, Shey) and 9 nomadic clusters in Changthang (Chushul, Nyoma, Kuyul, Kharnak, Hanley, Sumdho, Samet, Chumur, Maque and Kashung). The district administration had allotted 6,810 kanals of land to Tibetans in Shey, Choglamsar and Agling out of which 1,141 kanals were sold illegally by Tibetans to the locals while there are no reports of selling land in the Changthang area. Abdul Rahim, Tehsildar, Tangtse, and Vilayaat Ali, Naib Tehsildar, Nyoma, have informed that there are no clear records of the land allotted in the Changthang area. They have also informed that there were no records of illegal selling of lands in the region. Earlier, there was a separate officer known as Assistant Commissioner for Tibetan Refugees who looked after the land issues but the office was closed in the 1990s. Later, the responsibility was given to the Sub-Divisional Magistrate (SDM). “Land must be given on lease basis and with legal documents. How the government of India and the state government can give land to the Tibetan without any legal document?”, Dhondup Gyalpo, Changthang co-ordinator questions. He says that lease deeds between the District Collector and CRO office should be signed to prevent land frauds. After that the CRO office will be responsible for any kind of illegal selling of land. “We are very much hopeful that they will provide us the land on lease and it will be good for both. So in order to avoid such problems in future in Changthang, we are requesting the local government to provide proper documents to prevent such land frauds. Also, there are many cases of land encroachment in Leh”, he said. In a meeting that was held on 25 August, Dorjay Mutup, Chief Executive Councilor, urged Sonam Tobgais to make a committed effort and initiate action to keep a check and stop selling lease-land by the Tibetans to the locals. “The Tibetan government- in- exile and the CTA in Dharamsala, as well as the settlement office in Choglamsar, have been warning Tibetans not to sell their lands. We are not authorized to take legal action and it is with the state government. If the state government takes any kind of action against the defaulter, we don’t have any objection and it will be a welcome step”, says Dhondup Gyalpo. He says that it is beyond their reach to solve this problem. District administration has done a survey in Leh and from now onwards people can’t sell their land. This is one of the initiatives of the government to stop further selling of land illegally. According to the office of the Tehsildar, Leh, no records are available with the office showing lands allotted to Tibetan refugees and of lease/patta agreement executed. The committee has conducted a survey on the basis of Girdawari record and Latha Massavi and on-spot position. Dhundup Gyalpo says, “In the year 2014, under the Ministry of Home Affairs, there was a policy known as Freedom Fighter and Rehabilitation policy, which was not implemented due to the special status enjoyed by the J&K state. We have been approaching the local administration and the state government. Our CRO had met the Chief Minister and Deputy Chief Minister several times but it is still not implemented. In places like Dehradun and Karnataka, it has already been implemented. The Tibetan Rehabilitation Policy, 2014, devised by the Home Ministry, allows Tibetans to officially pursue jobs across sectors including nursing, teaching, chartered accountancy, medicine and engineering. The benefits of the state and central schemes like the Public Distribution System, Indira Gandhi Awas Yojna, etc., were also expected to be extended to Tibetan refugees (subject to availability of food grains). The local government has been providing equal facilities in health sector. However, there are various state and centre government schemes which are not extended to the Tibetans. Even if we are not eligible for the state government schemes due to the special status, the Central government schemes should be extended to us,” says Dhondup. Avny Lavasa, DC, Leh, says, “The Tibetan Rehabilitation policy is a policy which comes under the ministry of Home affairs and within that there is a formal mechanism of allotting land to the Tibetans. But in J&K, Article 370 and 35 A prevents allotment of land to refugees because they are non-state subjects. The land given to the Tibetans in Ladakh is not on lease basis because in J&K we cannot give land on lease basis to non-residents. If the problem has not been there, then this rehabilitation policy would have been implemented”. Also, many Tibetans living in Changthang area have been approaching the CTA office for many years now, asking for land in Leh. Dhondup says that many refugees have been migrating to Leh city in search of livelihood especially in winter due to harsh weather conditions in the Changthang area. The Hill Council, Leh, has been looking for a land to be allotted to them but finding it difficult to find a suitable land as most of them are already occupied.